Nowadays, free recharge providing sites are common. 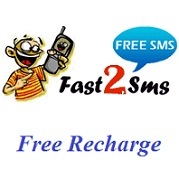 Today we are going to let you know of Fast2sms Free Mobile Recharge website. Another site that looks like to be a genuine one. An average Indian sends 50-100 SMS in a month. Fast2sms.com provides a unique platform to such users where they can send free messages and get rewarded with a free mobile recharge in return. Joining the free recharge portal is completely free. You can redeem earnings in the form of Fast2sms FREE Mobile recharge OR FREE DTH Recharge. To withdraw user should have a minimum balance of Rs.10. 1. Register yourself at Fast2sms Here . 2. Fill in the Sign Up Form by filling in your Mobile Number, Email Id, Name, Date of Birth etc. 3. Click on “Verify and Register”. 4. Next, you will receive your password on your mobile number. 5. Now use your Mobile Number and Password to Log in. 6. Next change your password as you like it to be. 7. Now start earning free recharge. For sending sms: 2 paisa/sms. For Playing Quiz: 2 Paisa/Question. For inviting friends: Rs.2 per invite. Fast2sms is an online platform to send free messages to mobile numbers but with a reward in return. It is a Free Recharge Portal through which users can earn free mobile recharge by simply playing quiz’s,sending sms and inviting friends. Sending SMS through Fast2Sms.com is absolutely free. In fact, you will earn by sending every single text. So, start sending messages which will lead to a good earning every time. What you need to do is just register at the website and then you will land into an exciting world of Fast2Sms, where you can earn for FREE. You can redeem earnings in the form of Fast2sms FREE Mobile recharge, FREE DTH Recharge or even direct BANK transfer. I have faced no such problem. Please recheck your login details. If the problem remains use forgot password feature.